The trooper’s marked patrol car was stopped with emergency lights on when it was hit, the Florida Highway Patrol said. 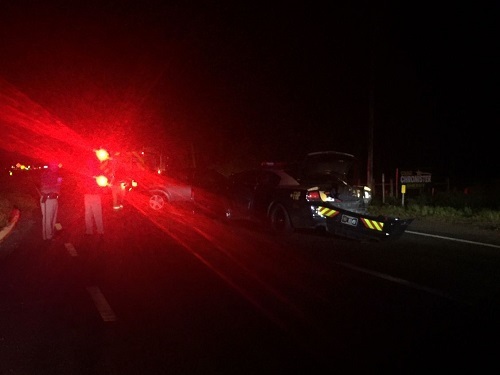 HILLSBOROUGH COUNTY – A state trooper was seriously injured this morning (Aug. 6) when another driver crashed into his patrol car on State Road 60, the Florida Highway Patrol said. Sgt. Leif Cardwell, 48, of Tampa, was taken to Lakeland Regional Medical Center with serious injuries. The other driver, Amanda D. Casull, 28, of Valrico, was taken to Brandon Regional Medical Center with minor injuries. The crash happened about 1:54 a.m. on SR 60 just west of Smith Ryals Road in Hillsborough County. Cardwell was stopped in his marked cruiser, a 2014 Dodge Charger, with the emergency lights activated to warn oncoming motorists that the roadway was closed in both directions for repairs to a nearby railroad crossing. Troopers said Casull, who was driving a 2013 Chrysler 200, failed to stop and collided with the rear and passenger side of the FHP Dodge. Photos courtesy of the Florida Highway Patrol. The trooper's marked patrol car was stopped with emergency lights on when it was hit, the Florida Highway Patrol said.